Entrepreneurs across the globe are constantly coming up with new ideas, businesses, and inventions that can help both them and their communities. In emerging markets new businesses are particularly important as they provide needed services, create jobs, and add to the local economy. The creation of viable businesses should be encouraged, but due to a lack of credit and collateral it is often these businesses that find it the hardest to get off the ground. Banks in emerging markets are wary of giving out loans that could be considered risky, which can slow down businesses and consequently economic growth in a region. The US Agency for International Development (USAID) recognizes this problem, and their Development Credit Authority (DCA) helps fill this financing gap in emerging markets by taking on some of the banks’ risk and by partially guaranteeing loans for borrowers. Since its creation in 1999, DCA has made $3.1 billion dollars of credit available to borrowers across 71 countries, and has only seen a 1.85% default rate on these guaranteed loans. Many borrowers who banks previously classified as unqualified for a loan have gone on to get larger loans without USAID’s guarantee, and seeing the success of USAID guaranteed borrowers and industries makes banks more likely to make similar loans to those not partnered with USAID. To identify those in need of loans and the reasons that borrowers may be apprehensive about requesting loans, USAID DCA conducts research in the regions they work in. But, as with many other industries, face-to-face surveys can be slow and costly, so DCA recently partnered with GeoPoll to conduct surveys through text message in Nigeria. 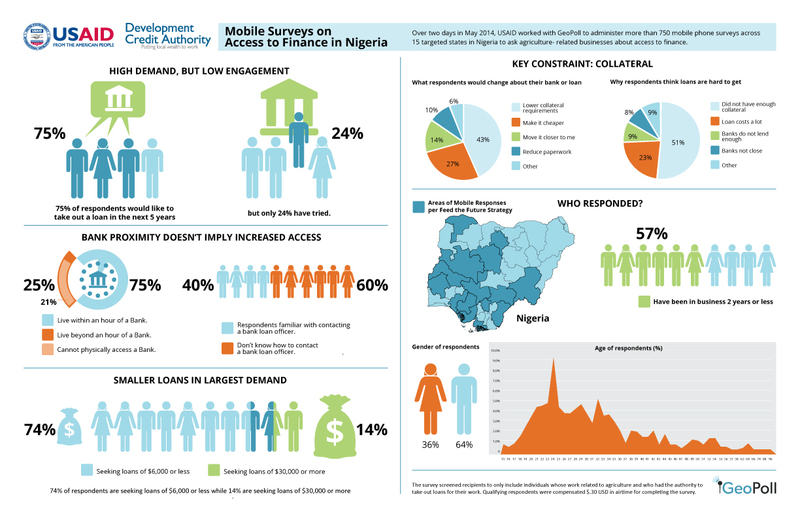 Over two days in May 2014, the DCA worked with GeoPoll to administer more than 750 mobile phone surveys across 15 targeted states in Nigeria to ask agriculture- related businesses about access to finance. Participants were screened to identify those who worked in agriculture and had the authority to take out a loan for their work, which allowed DCA to gather information from a very specific group of respondents. The study found a major gap in local financing available for these businesses. In particular, while 75% indicated that they would like to take out a loan in the next five years, only 25% have tried. Most of these business are newer and 40% are seeking 100,000 NGN (~$620 USD) or less, but are deterred by high collateral requirements and not knowing how to contact loan officers. With this knowledge, USAID can more strategically and confidently invest in the agriculture sector responsible for feeding 170 million Nigerians, or nearly 20% of the population of sub-Saharan Africa. The below infographic has more facts and figures on the findings from this survey. For more information on our on-going collaboration with USAID/DCA see our full case study, and stay tuned for future posts about other upcoming mobile surveys in areas of monitoring and evaluation with USAID/DCA.